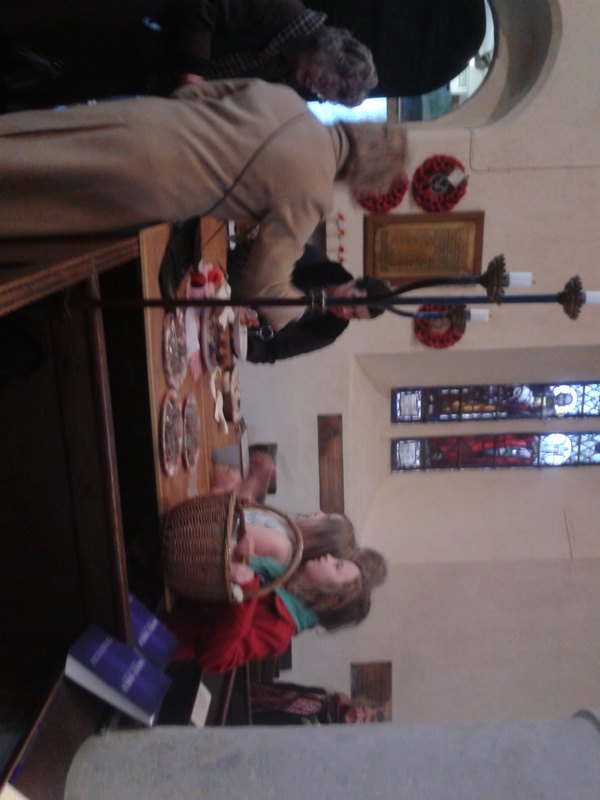 The cubs came into church to practice their parts in our Remembrance Service. I that they would need some form of sustenance on a November evening and that hot chocolate and something appropriate to munch on would be in order. 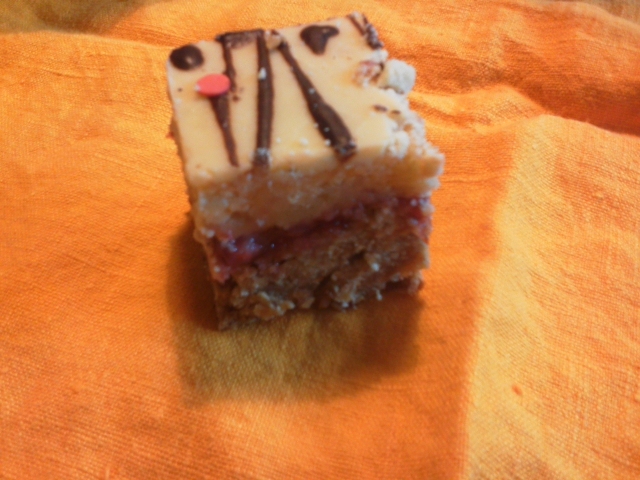 I adapted these from a recipe in Jacqui Bellefontaine’s book Best Love Cookie Recipes. Preheat the oven to 200c or Gas 6 and grease baking trays. Sift flour and cornflour into a bowl. 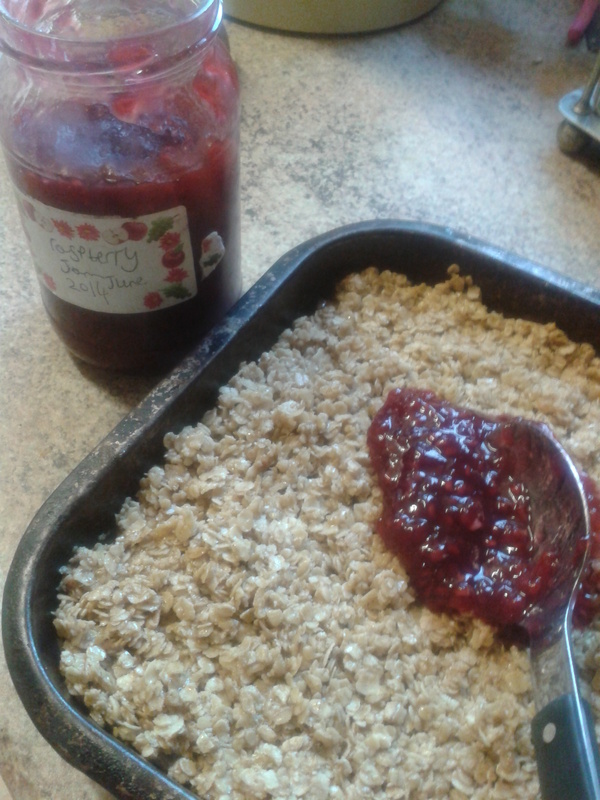 Cut butter into small pieces and rub into flour to make ‘breadcrumbs’. Stir in icing sugar and lemon zest. Add juice and squeeze together to make a dough. Roll our cookie dough on a lightly floured surface, and cut out flower shapes. 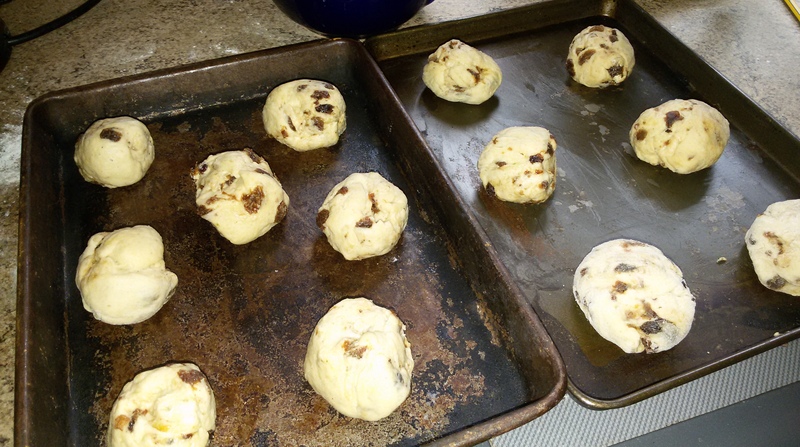 Place on trays and bake for aprox 8 minutes until lightly coloured. Allow to cool on tray for a couple of minutes then move to cooling rack. My first attempt at outline and flood using royal icing. The outline needs to be thicker than the flood icing. I found help in Mia Sinclair’s Ginger Bread Wonderland. Sift sugar into bowl, add egg white and lemon juice. Whisk until a ‘smooth, but not wet, stiff peak consistency’. Adjust icing to make soft peak for outlining, by adding water a drop at a time – you are looking for ‘icing that holds a soft peak but does not spread on its own’. Keep some icing back for the black centres, then add red colouring – getting a poppy red is really quite tricky, but do your best! Pipe the red icing around the outside of the poppy, and pipe a small circle in the middle. Now add more water to the red icing until ‘you have a thick but runny icing that smooths out on its own within 15 seconds, but not so runny it runs off the edge of your biscuit’. Use this to ‘fill’ the outlines on your poppies. 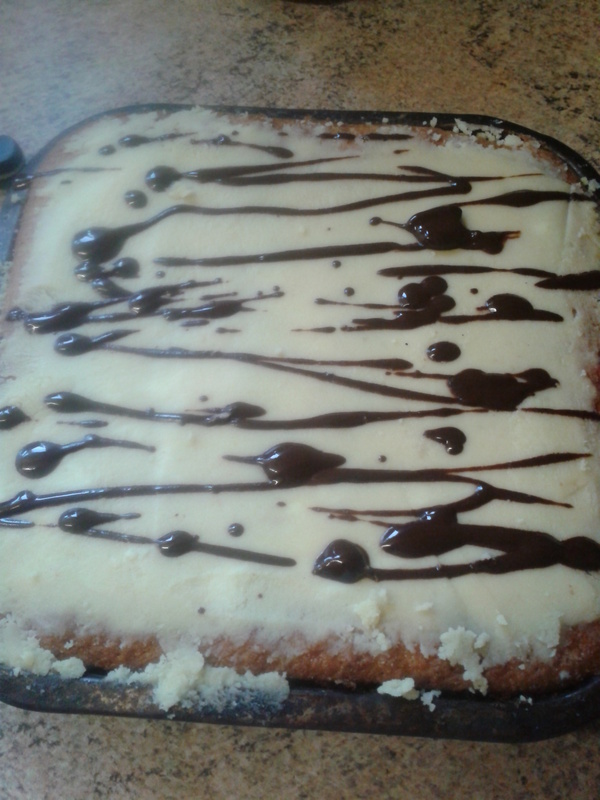 Colour the left over icing as black as you can and then carefully fill in the middle circles. Leave for the icing to set. Palm Sunday feels like a great celebration, even though we are travelling ever closer to the cross. Palm Sunday leads us straight into Holy Week, but before the betrayals, the denials, the false accusations, and kangaroo court, before the death sentence, comes the triumphal procession. As we wave our palms, we remember how Jesus’ followers paraded him into Jerusalem with acclamations and singing. Sunday is also a day when we are allowed to be refreshed a little from our Lenten fasting, so I thought these donkey biscuits would be just great to nibble with our after church cuppa. Legend tells us that donkeys bear a cross on their shoulders just as Jesus did on his, as a reminder of their great service that first Palm Sunday. Set the oven to 160c / gas 6. Mix in the egg yolks, orange rind, and flours until a soft dough forms. Roll out the dough on a floured surface (1 cm thick) and use a donkey shaped biscuit cutter, being careful with the ears. Bake on a greased sheet until for 15-20 mins or until golden brown. Loosen the biscuits immediately (I left my first batch to harden on the tray and then struggled to lift them, resulting in a lot of broken legs and wonkey donkeys!) and place them on a cooling rack. Melt the chocolate and use it to ‘paint’ crosses on the back of the donkeys and add a tail too if needed. 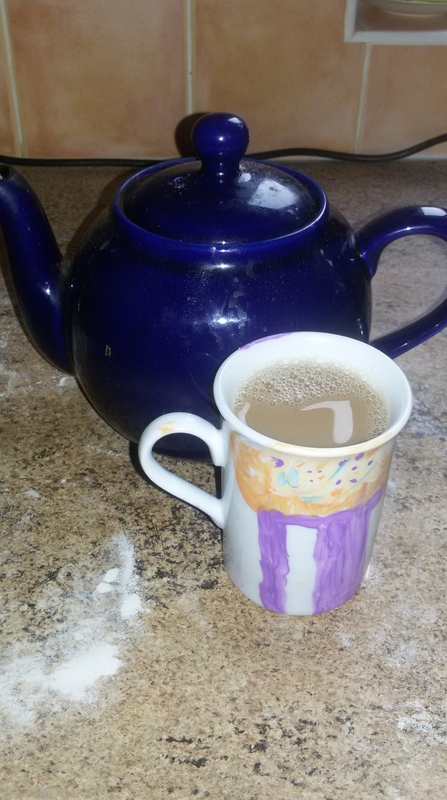 Put on the kettle and enjoy with a cuppa…. Hosanna! Stir up we beseech thee, O Lord, the wills of thy faithful people; that they, plenteously bringing forth the fruit of good works, may of thee be plenteously rewarded; through Jesus Christ our Lord. 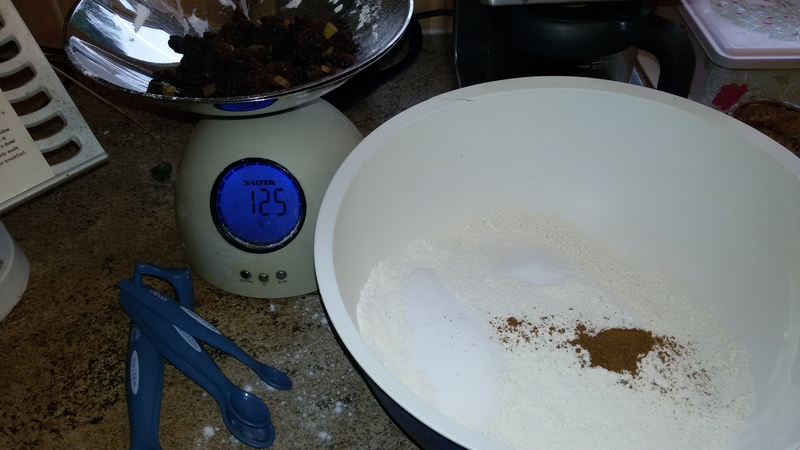 but falling as it does, the week before Advent begins, has also become a good time to ‘stir up’ the Christmas pudding. Within the new lectionary this Sunday is called Christ the King – the last hurrah before the Advent fast begins – as the church year which begins with the Advent waiting culminates with Christ upon his throne. It seems somewhat fitting that the king of puddings is prepared this Sunday too! There are lots of traditions linked with the making of Christmas puddings and I’m sure even more recipes. The pudding should always be stirred from East to West in recognition of the Magi, the wise men from the East, and each member of the family should have a turn stirring the pudding and making a wish. Stir up we beseech thee, the pudding in the pot, and when we get home we’ll eat the lot! Our family traditions have changed over the years, but for the past decade 3 generations have gathered together to give the pudding a stir and make our wish. 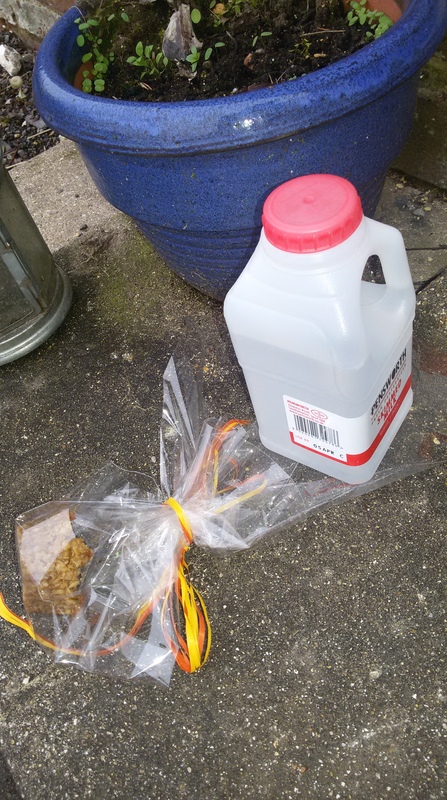 This tradition began in 2005 – the year my first-born almost ended up in the pot! I think almost more important than the ingredients are the family traditions that go with the making. Our traditions may be different than yours, we tend to meet together during the half term holiday, and until this year have met at Granny and Papa’s house. We have even used a different recipe this year , based on a Nigella recipe, but the important things have stayed the same: stirring, wishing, watching Papa fall in the sink as he tries to record it all for posterity! 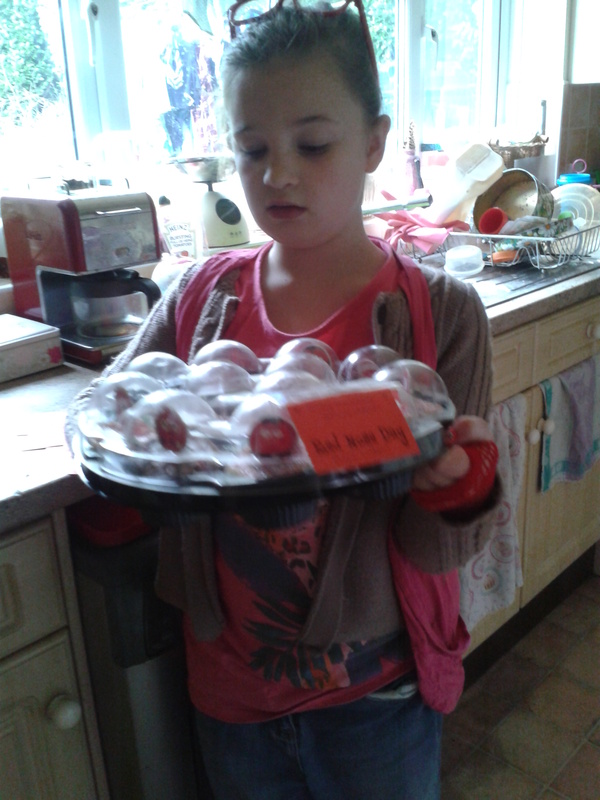 Check fruit for quality control. Soak the fruit in the JD overnight, and the coins in the coke. Pour yourself a drink and enjoy some family time together. Chop, grate and crumb the ingredients as necessary, then add them to a large mixing bowl. Add the soaked fruit and any left over juices. Drop in the coins and discard the coke – whoever discovers these in their portion of pudding in Christmas day is blessed with luck and fortune for the coming year. Thank you, thank you that will do, may your wishes all come true. By the time everyone has had a thoughtful stir and a wish, the ingredients should be well and truly mixed. Butter the pudding basin and put the mixture into it. 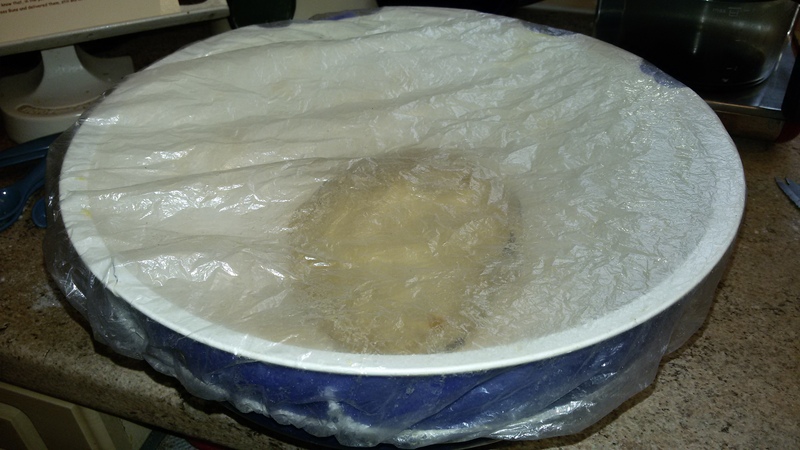 Cover with a piece of greaseproof in which you have folded a pleat, and put on the lid. Boil or steam the pudding for 31/2 hours. Rewrap the pudding and store somewhere cool. On Christmas day, just before you set down to eat that lengthy meal, pop the pudding back on to steam for another 31/2 hours. Once the Turkey has been demolished the pudding should be presented to the table in flames (heating up a cupfull of brandy or vodka, pouring it over the upturned and holly sprig adorned cake, before setting alight). Why we set fire to the pudding, I don’t know, other than another occasion to show off culinary skills. Perhaps this is why celebrating Christmas was banned by the puritans? One of our family traditions has been to ‘pipe in’ the pudding, by humming a highland fling whilst holding your nose and taping your windpipe. Again I have no idea why we do this, but it’s tradition and brings our family together. Trinity Sunday is the preaching slot most dreaded in the church calendar. It is the Sunday when we try to explain (without invoking any heresies) how the One True God could be three persons – Father, Son and Holy Spirit. St Patrick famously invoked the three leaf clover to try and explain how one thing could be made out of three components, however, each of the leaves are identical to each other, and Father, Son and Holy Spirit are not clones of each other. Last year I hit upon the idea of the Twix – Shortbread is shortbread with or without the caramel, and caramel is caramel without the chocolate, but only when the three come together do they make a Twix. 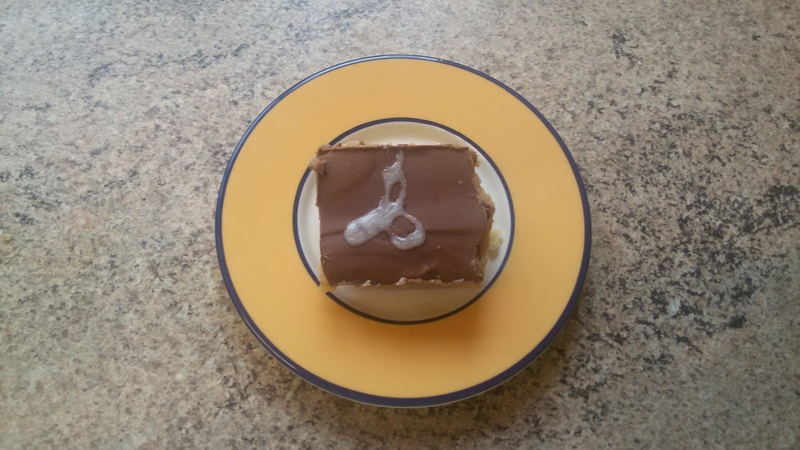 So with that in mind I decided to celebrate this last feast of the Easter season by creating Trillionaire Shortbread! 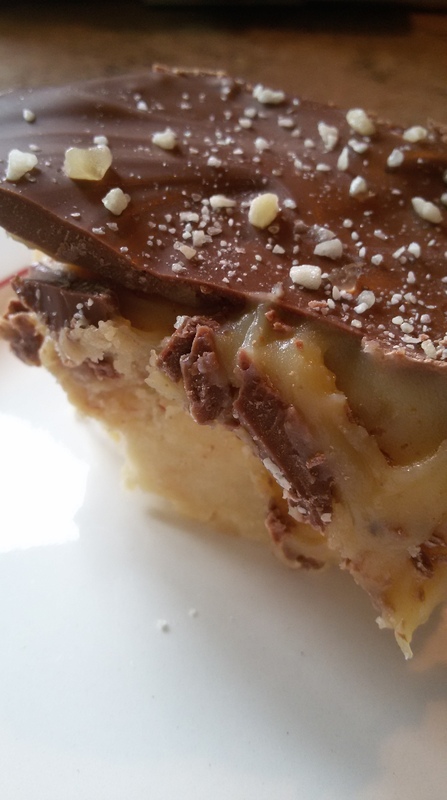 As with a Twix bar, (and ordinary Millionaire Shortbread), this gorgeously gooey biscuit, has three distinct elements, shortbread, caramel and chocolate. However, this is Trillionaire Shortbread, and as an image of the Holy Trinity, something else is needed, something that speaks of the wonder of God, something that speaks of the miraculousness, of the life-giving nature of God, the challenging nature of God who wants us to grow and develop into the most wonderful of human beings, God who invites us into the Holy dance of the Trinity. 325g chocolate (I used quality milk chocolate, but dark chocolate would balance the sweetness of the caramel. 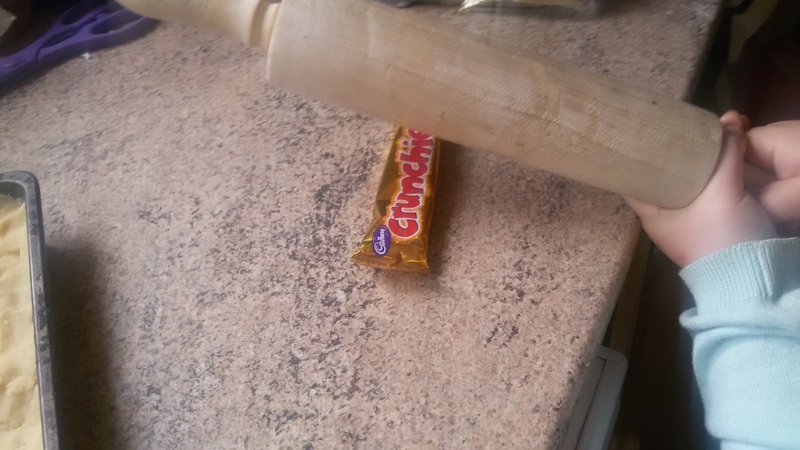 2 Crunchie bars or cinder toffee. 1. Make the shortbread. Mix together the dry ingredients in a large bowl. 2. 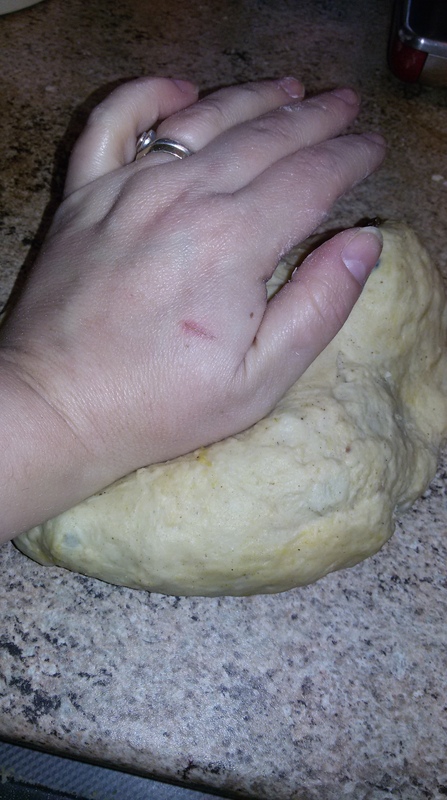 Rub in the butter until it starts to clot together, then knead it into a ball shape. 3. Press it down into a square tin ( 23cm square – greased and lined). 5. 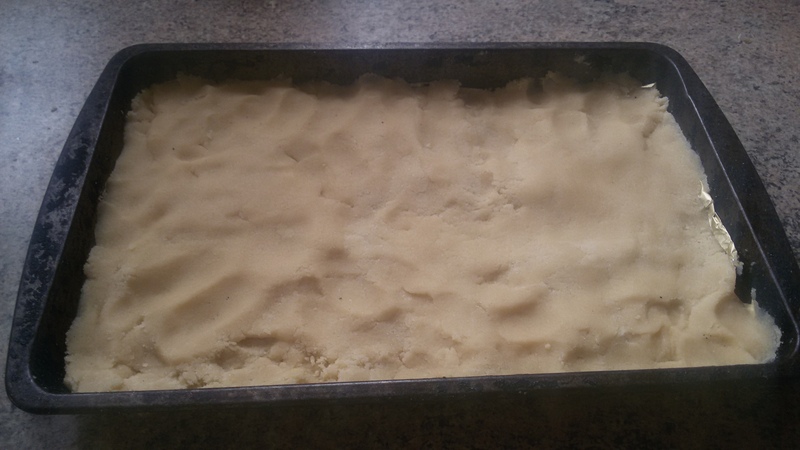 Bake the shortbread for 45 minutes or so until a pale biscuity colour. Leave in tray to cool. 6. Make the caramel. 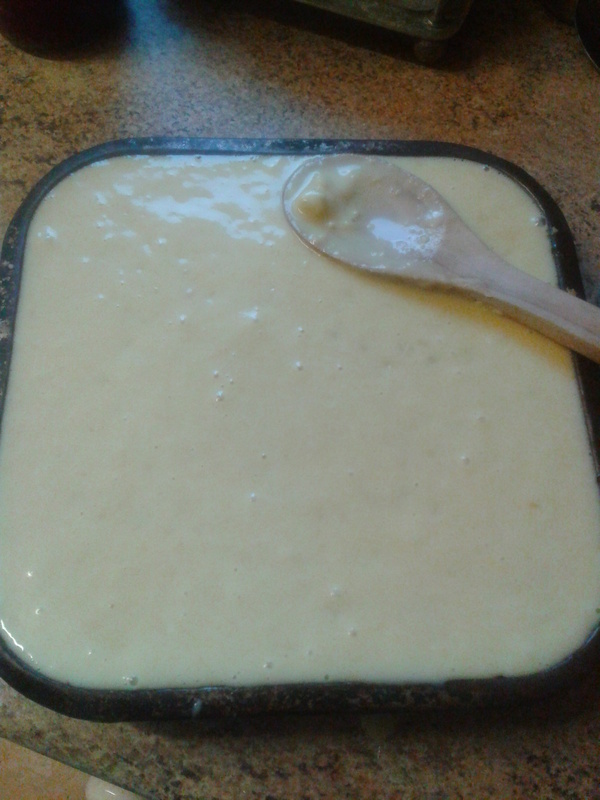 Melt together the butter, milk and syrup, stirring as you let it bubble up. Once it is a golden brown colour, and has thickened nicely remove from heat to cool a little. 7. Pour the caramel over the shortbread and leave to set. (I did this bit overnight). 8. 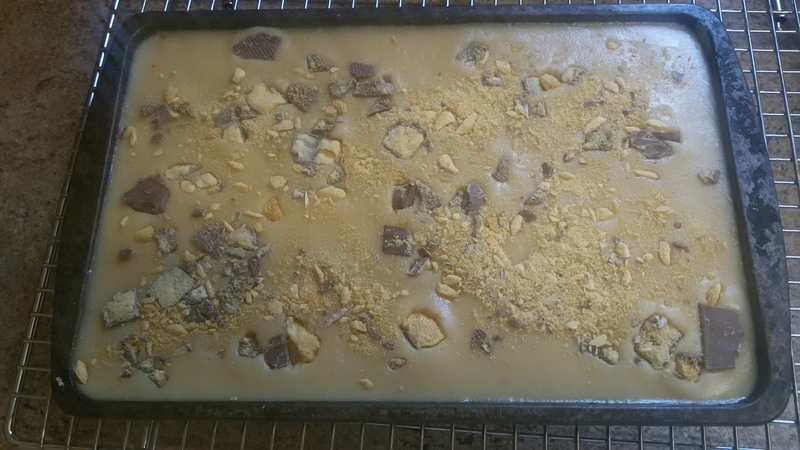 Crush the second Crunchie and pour over the caramel. 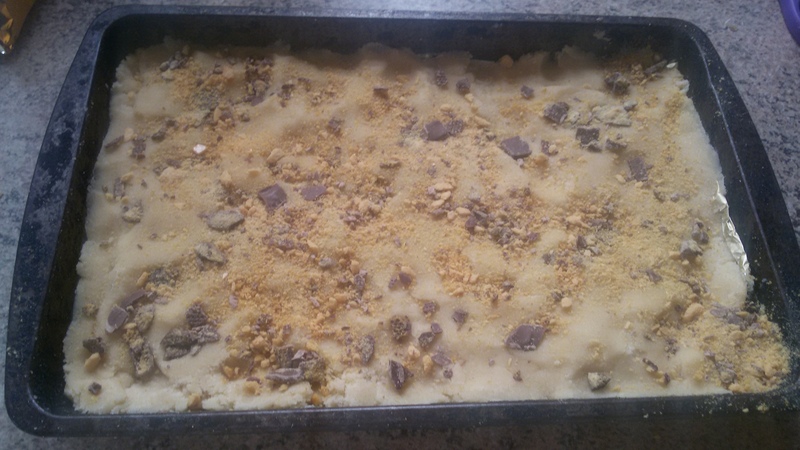 Roll over the top of the tray-bake with you rolling pin to smoothen out the surface. 9. Gently melt the chocolate (professionals do this over a ‘bain marie’ of hot water, techies use the microwave, I used a saucepan on a low heat over the hob. Whichever way you choose you will need to keep an eye on it. 10. Once melted, leave it to cool slightly by pouring it over the caramel. 11. Leave in the fridge to cool. 12. I had intended to cut this into triangles as another indication of the power of three, but it was just a little too gooey, so squares had to suffice. I used glitter icing to mark the celtic symbol for the Trinity on the top of each one, but as it didn’t set, simply added to the ‘goo’. Melted white chocolate may work better. 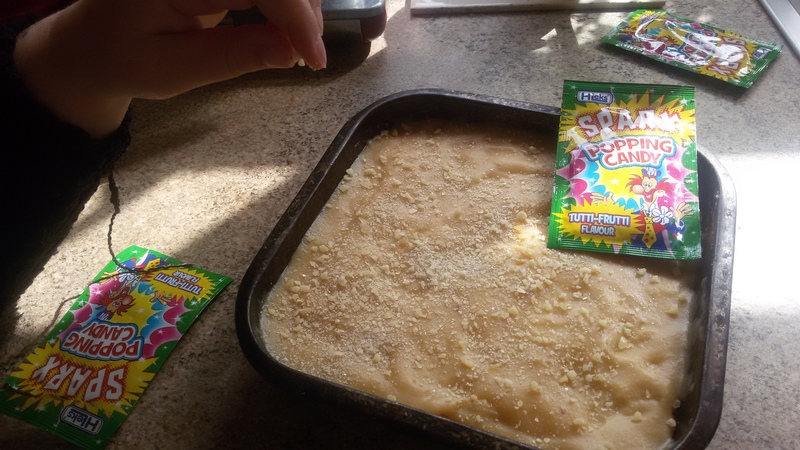 Instead of using Crunchie bars or cinder toffee, use popping candy. In fact as a family we decided that this works much better. The three different elements are more distinctive and the popping candy has a more subtle yet powerful effect on the palate. Also it doesn’t add to the general ‘goo’ of the cake. One of my favourite resurrection stories, is about the time that Jesus surprised two of his disciples who had decided to call it a day. and were dejectedly walking away from Jerusalem and were on their way home to Emmaus. These two Cleopas and his travelling companion (unnamed, so probably his wife), had hoped so much that Jesus would be ‘the one’ and had given up everything to follow him, and yet, at his death their hopes were dashed so brutally that they couldn’t believe the resurrection stories that were being brought to them. Jesus, gently walks alongside them, unrecognised by the two, and talks with them, reawakening their hopes as he travels through the scriptures with them from Genesis to the day that they are walking in. It is now dusk, and they have reached home, and so they offer the stranger a meal and a room for the night. Honouring this man who has walked with them, they ask him to say the blessing over the bread, and as he does so, they finally recognise him for who he truly is. At their recognition of him, however, Jesus disappears, and the two, renewed in their faith and hope, also leave the table and return to Jerusalem to share their story with the disciples who had stayed behind. 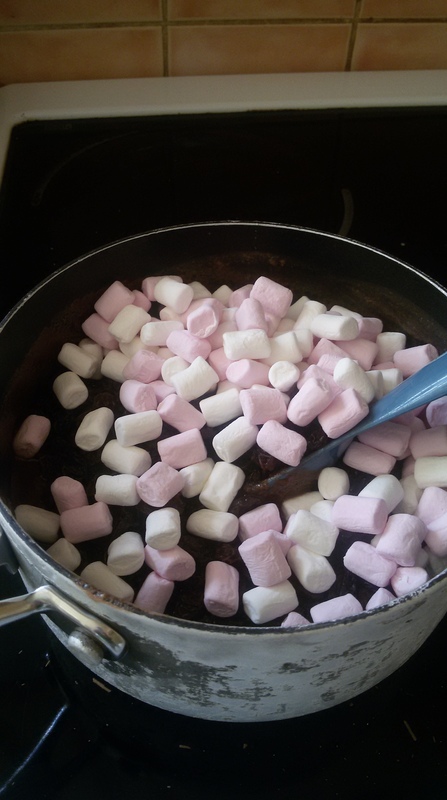 One of my favourite recipes is Rocky Road – and what a wonderful way to link the two…. 1. Break up the biscuits by placing them in the bag and hitting with a rolling pi n! You want a mixtur e of ‘dust’ and ‘hard stone’ size pieces. 2. 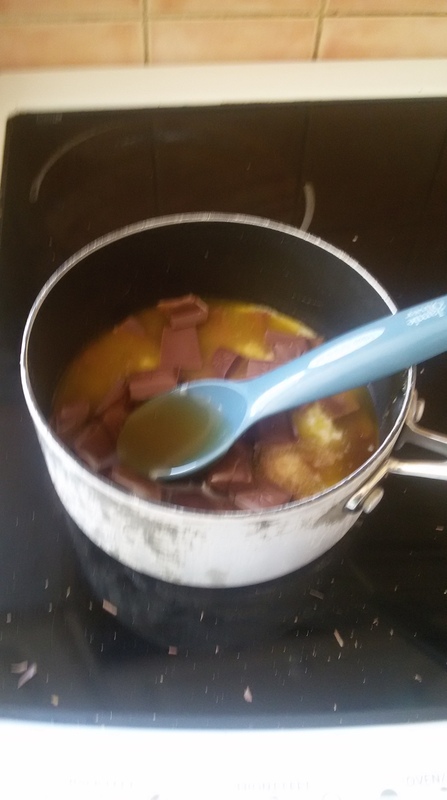 Melt the butter, chocolate and syrup together. 3. 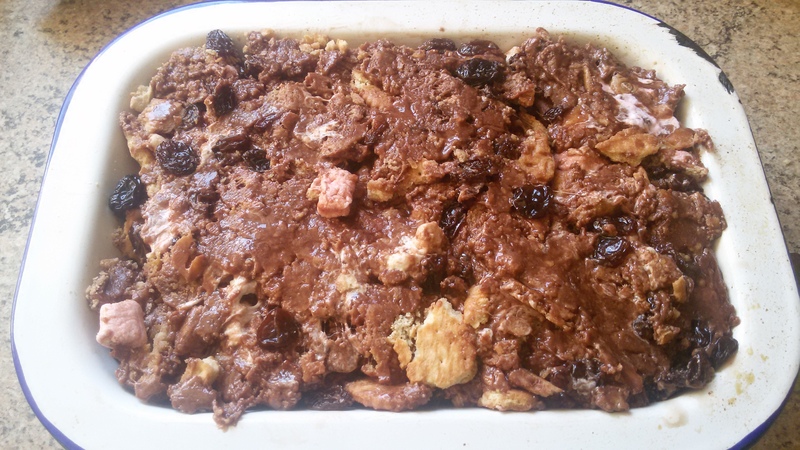 Add the raisins, biscuit and marshmallow to the chocolatey mix. Try to do this last bit with speed, otherwise your marshmallows will melt and you will get a sticky, muddy road to Emmaus instead of a rocky one! 4. Transfer to a greased dish and leave in the fridge to set. I am writing this on Holy Saturday – lent is almost over and I’m drooling at the though of roast lamb tomorrow. I am also quite excited about the celebrations of Jesus’ resurrection which will begin tonight when we light our paschal candle for the first time and bring the Jesus’ light into the church, into our hearts and homes. We will celebrate with Holy Communion, with champagne and fireworks. The blessings of Easter are too wonderful to keep to ourselves. How can we bless others? Blessing is different from almsgiving, it isn’t about alleviating poverty, but bestowing joy. 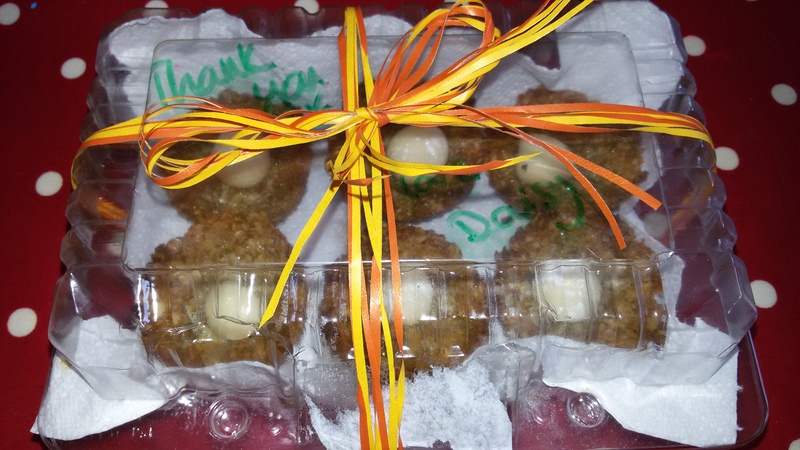 We are accustomed to giving gifts of thanks at Christmas – traditionally Christmas boxes have been given to all those who supply services for us, and more recently teachers seem to be inundated with thank offerings at the end of the Christmas term. Why not spread this concept to Easter, after all Easter is at least as holy a festival as Christmas? And why stop at teachers and paper ‘boy’s? Why not thank our children’s cub leaders, swimming instructors, Sunday school teachers? 1. 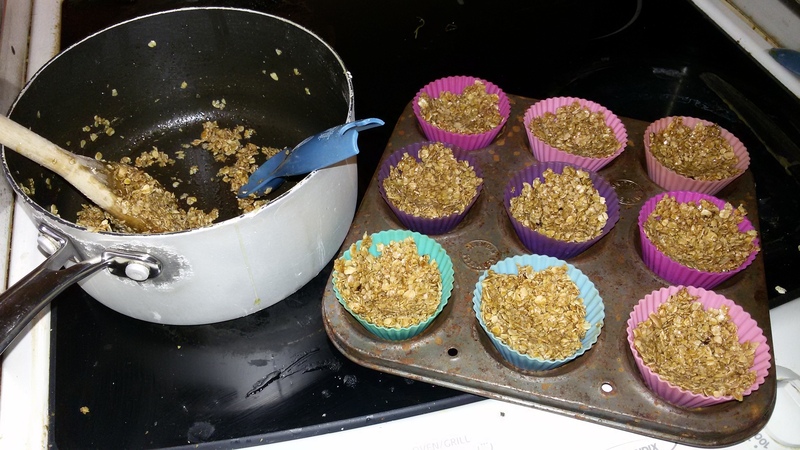 Mix up your batch of flapjack mix and dollop into silicon cupcake cases. These will form ‘nests’ so use the back of a spoon to make an indent in the top of each one. 2. Cook for aprox 10 minutes, take them out to cool, using the back of the spoon to remould the nest shape if needed. 3. Whilst cooling, shape eggs from marzipan, and then roll or dust them in glitter. 4. Remove the cooled nests from their cases, and add an egg to each one, giving them an extra dusting of the sparkly stuff if you feel so inclined. 5. Package appropriately for your chosen beneficiaries. 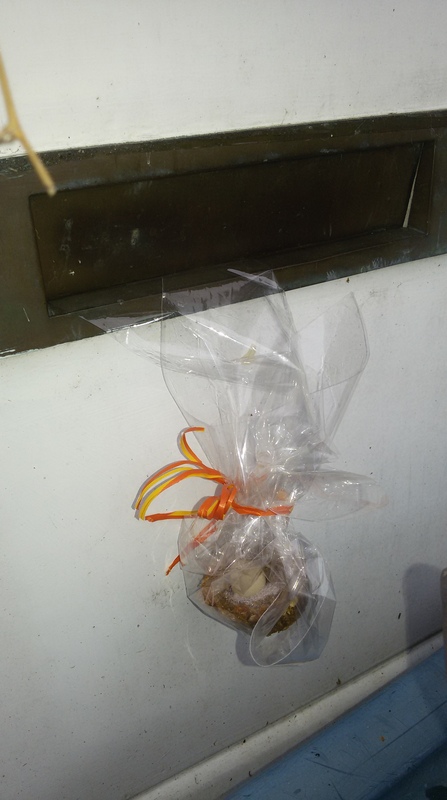 I am quite a Womble and tend to keep those things that ‘ordinary folk leave behind’ and always have an excess of things that can be used to make pretty parcels. It wasn’t until the 12th Century that a monk came up with the idea of adding a cross and turning them into cross buns. The ‘hot’ bit comes from them being the only ‘bread’ that would be sold on Good Friday, and delivered warm. Even in the 1990s when I had a holiday job at a bakers we would only open for the morning. In 1592 Queen Elizabeth the 1st declared that the hot cross buns were too holy to eat on any old day and so she decreed that they could only be sold on Good Friday, Christmas or at funerals. To overcome this decree, people would bake them at home, but if they were caught baking, all the buns would have to be given to the poor. Now I wonder if that decree has ever been rescinded, or if we could summons the supermarkets who sell hot cross buns all year round to give all them up to the local food banks? Every year my mum would bake her own hot cross buns for breakfast, leaving them to prove whilst she returned to bed for a cuppa. We would snuggle in once we had woken ready for the breakfast in bed treat. Now it’s my turn to bake the buns! 1. Add the dry ingredients together (flour, sugar, salt, fruit) and mix. 2. Add the ‘wet’ ingredients, (yeast followed by the water and milk, melted butter nad mixed egg) and turn into a sticky dough. 3. On a flour dusted surface, knead until you have a ‘silky’ feeling to your dough. 4. Return to the bowl and cover. Now for the clever bit! Place in the fridge instead of a warm place so that it can have a long, slow rise whilst you sleep. 5. Because of the cold rise, there won’t be the normal puffiness and need to ‘knock down’ the dough, instead you need to knead (!) some warmth back into the yeast in order to have the elasticity needed to form the bun shapes. Once you have a dozen buns on a tray you can put them into a warm place to rise for another 10 minutes whilst you heat the oven to 190c/gas 5. 6. Mark a X with a sharp knife and cook for 15- 20mins. While then buns are baking you can get on with making a sugar glaze to highlight the cross, or snuggle back into bed with that cup of tea. 7. Serve warm with butter. If you are being true to the Elizabethan edict and eating these on Good Friday, then today is the day that we remember that Jesus died and was buried in a tomb built into a cave. The shape of the bun reminds us of the stone that was rolled in front of the cave to seal the tomb; the spices remind us that Jesus’ body should have been anointed for burial; the fruit remind us of the good that will ultimately come from his death. The cross, of course, speaks for itself. The life of a monk ought to be a continuous Lent. Since few, however, have the strength for this, we urge the entire community during these days of Lent to keep its manner of life most pure and to wash away in this holy season the negligences of other times. This we can do in a fitting manner by refusing to indulge evil habits and by devoting ourselves to prayer with tears, to reading, to compunction of heart and self-denial. During these days, therefore, we will add to the usual measure of our service something by way of private prayer and abstinence from food or drink, so that each of us will have something above the assigned measure to offer God of his own will with the joy of the Holy Spirit (1 Thess 1:6). In other words, let each one deny himself some food, drink, sleep, needless talking and idle jesting, and look forward to holy Easter with joy and spiritual longing. Everyone should, however, make known to the abbot what he intends to do, since it ought to be done with his prayer and approval. Whatever is undertaken without the permission of the spiritual father will be reckoned as presumption and vainglory, not deserving a reward. Therefore everything must be done with the abbot’s approval. I did seek within the Rule of St Benedict for some permission for feasting on a saint’s day, but all I could discover was that you use the Sunday form of worship instead of every day form. Nothing about feasting at all! So today we brunched on Eggs Benedict! This is normally served with a slice of ham, or perhaps bacon, and on a toasted breakfast muffin. You will need to seek permission from your ‘abbot’ in order to break from the Lenten fast and indulge in meat – we kept to the vegetarian option. 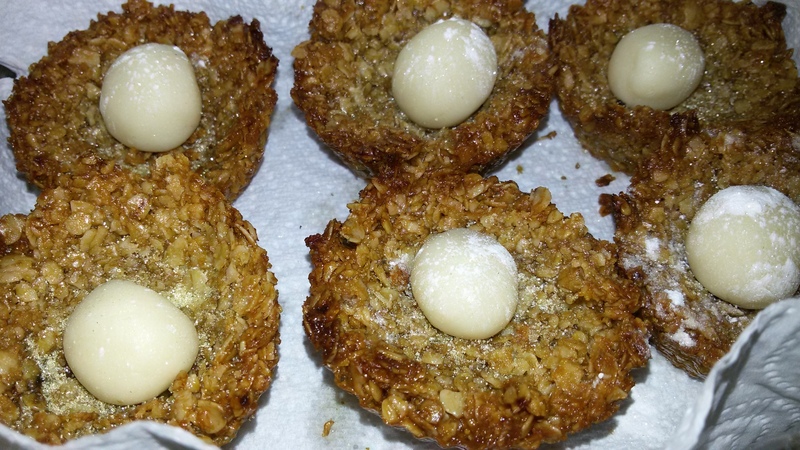 I also served our eggs on slices of Soda Bread left over from St Patrick’s Day which worked really well. 1. Melt the butter and skim off the froth (I do this in the microwave approx 1min 30sec). Leave to cool. 2. In a small heavy bottomed saucepan whisk the water and the egg yolks together (in Lenten Style, keep the egg whites to bulk out scrambled egg for lunch), with a little salt and pepper, for 30 secs until combined and light and frothy. 3. Put the pan on a low heat and whisk for 3 minutes until the mixture leaves ‘a ribbon’ for 5 seconds. DO NOT SCRAMBLE YOUR EGGS. 4. 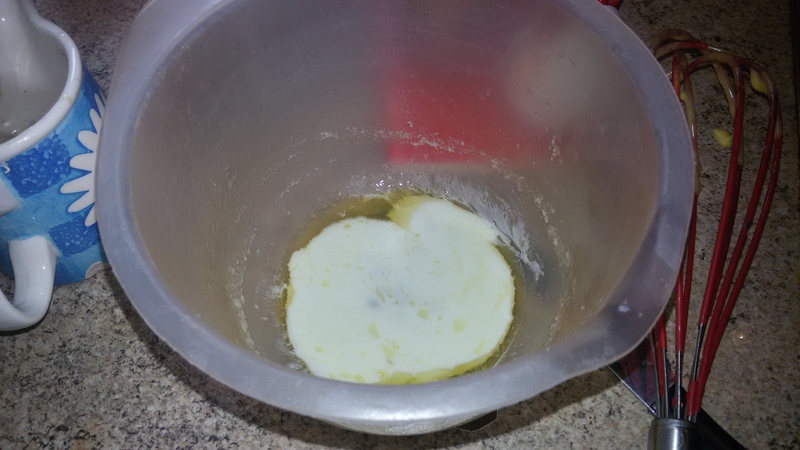 Remove from the heat and whisk the mixture as you dribble in the cool butter. You will discover a whitish ‘whey’ at the bottom of the melted butter, do not add this. 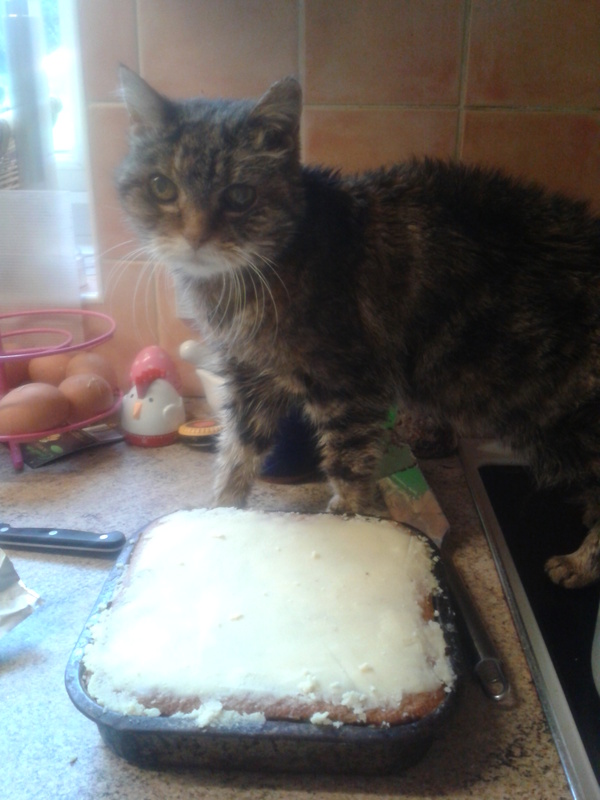 I haven’t discovered a use for this other than feeding to the kitchen cat! 5. Once the sauce has thickened, add the lemon juice to taste. 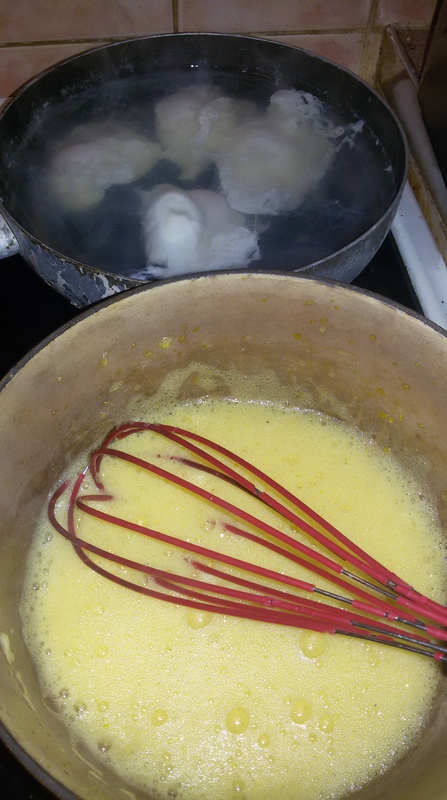 You have now made Hollandaise Sauce (which is reputed to be rather tricky – I was quite impressed at my first attempt – I think the key is not to let the eggs cook as you whisk them otherwise they will scramble). 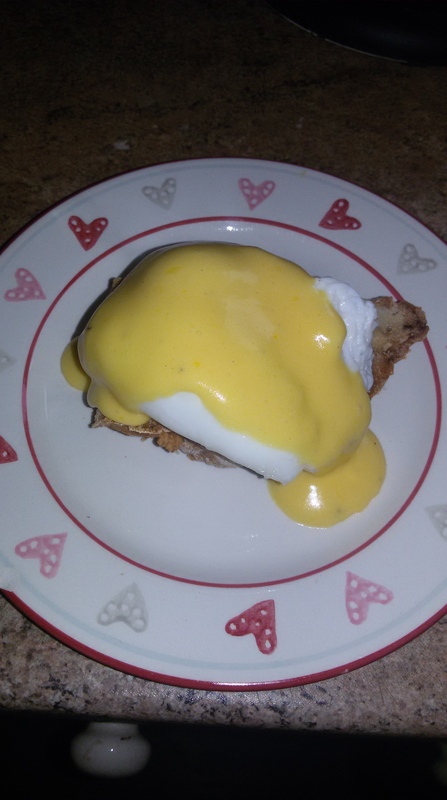 I haven’t given instructions to poaching the eggs – surely if you can make Hollandaise sauce you can poach an egg! 6. Serve the eggs on top of the soda bread, and pour over the sauce.